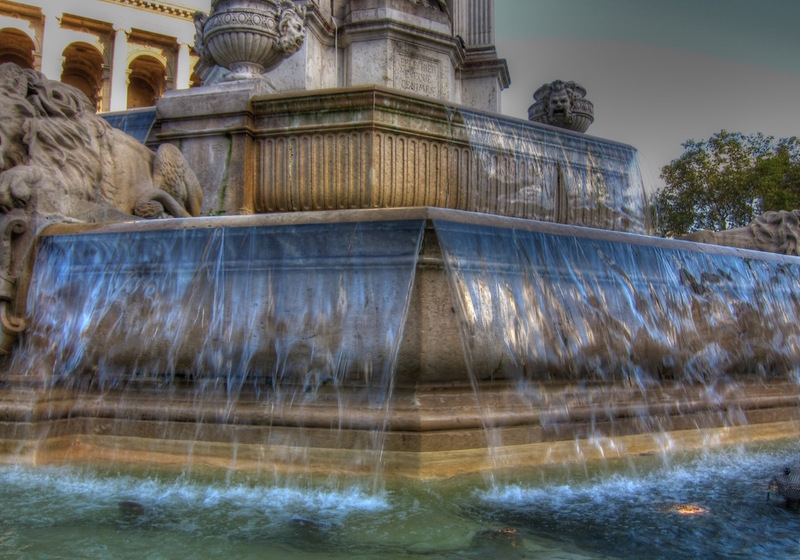 This is the fountain in front of Saint-Sulpice church which was made famous in the DaVinci Code. I was very curious how this shot would turn out. 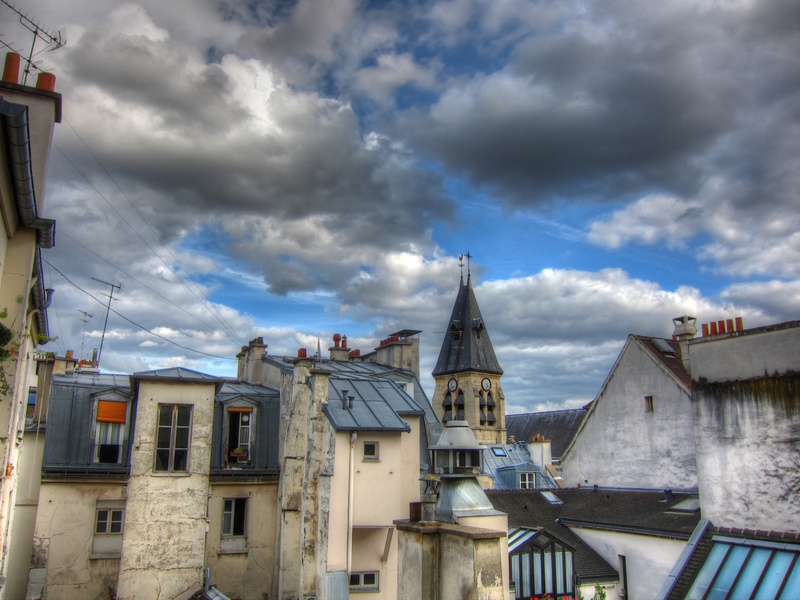 This may actually have been one of my first handheld HDR photos. There really was no place to put my tripod to get this shot. The tripod is about 6 inches tall so the ground didn’t work. There are no metallic structures to hang it off of (it’s magnetic). So I just handheld it. I was also very curious how the water would look when the three shots merged. I’m very happy with how it turned out. This entry was posted in Uncategorized on August 9, 2015 by robezman. I walked by this fountain many times. Sometimes it’s really nicely lit. Other times nothing special. It was actually my first image dealing with people moving. The guy on the left leaned forward between shots and the traffic light was shining right through him. Paris is full of very nice things. 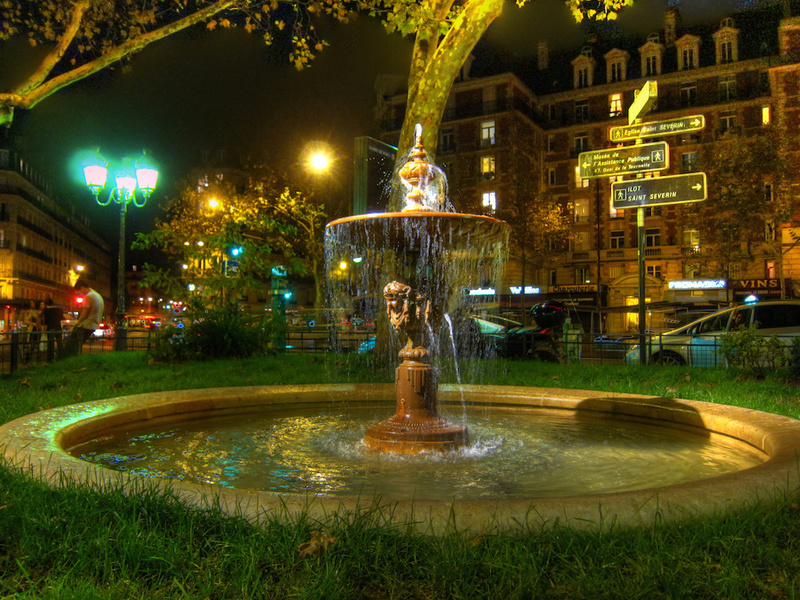 This entry was posted in Paris, Photography and tagged HDR, Paris, Photography on August 5, 2015 by robezman. This is a shot from last winter that I just processed. I’ve been a bit slow with the photos lately. Somehow this church is often very photogenic. Interestingly I walked by it many times without going in. When I did I was surprised. 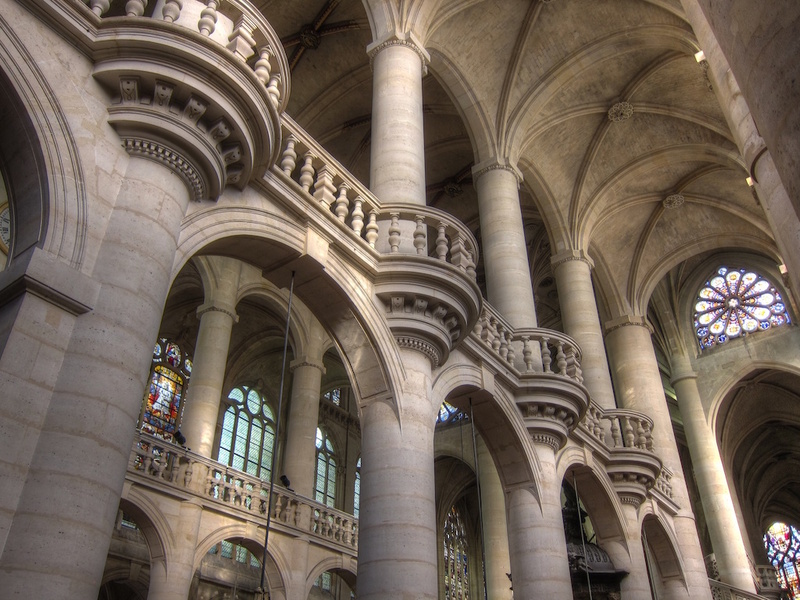 It’s maybe one of the most beautiful churches in Paris. I’ll leave the inside for another post. Gray skies and grayness are not really nice things but for HDR they seem to make the photos more interesting. Blue cloudless skies are not that interesting. Gray clouds add texture. I often also really like how HDR can bring out the texture in brickwork. Sadly though I find normal non HDR photos now a days to lack color. 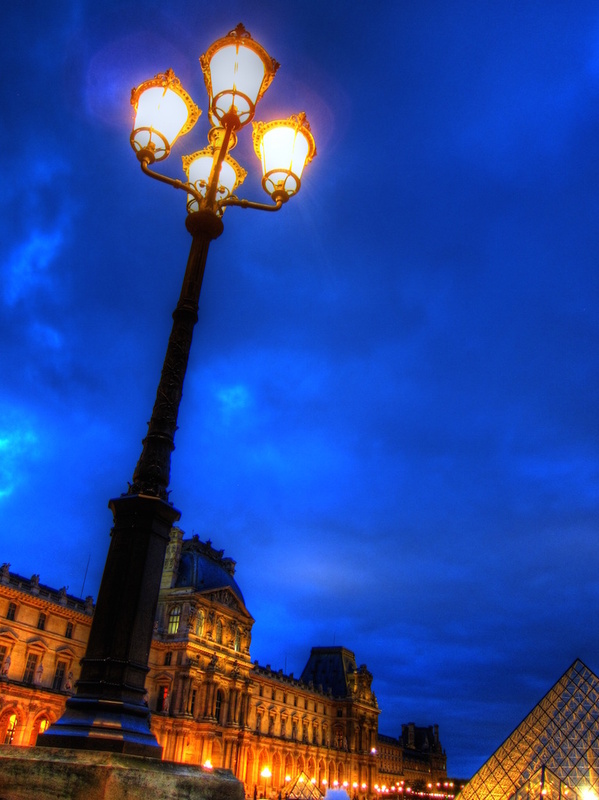 This entry was posted in Paris, Photography and tagged HDR, Paris, Photography on July 22, 2015 by robezman. 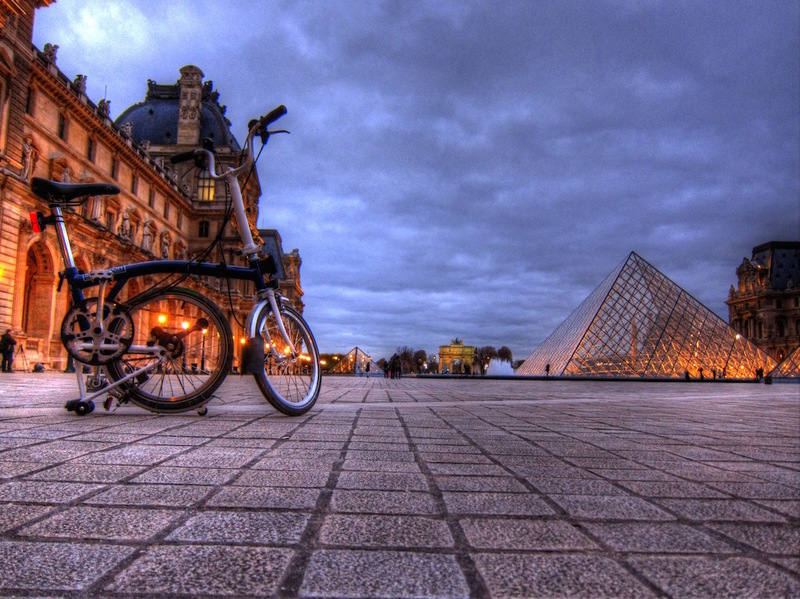 HDR photo of the Louvre Pyramids and a Brompton bike from a low vantage point with nice light and nice texture on the stone. 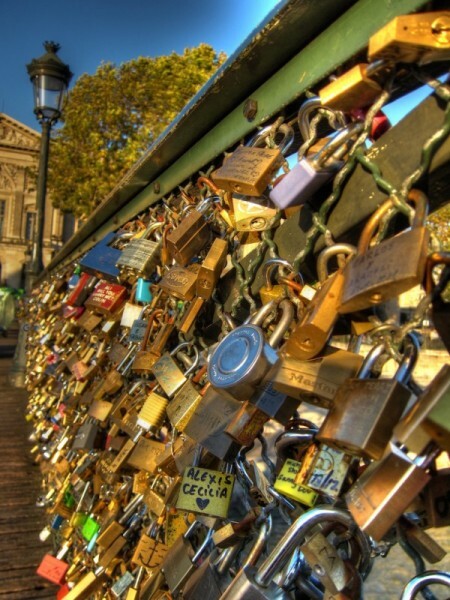 I found out by chance and last minute that Trey Ratcliff was in Paris and doing a photo walk. Of course I jumped at the chance. When I arrived everyone had all their fancy equipment ready. Full frame SLR cameras and fancy tripods. I’ll probably do a post in the future about my gear but at the time I was using a Canon S90 and magnetic Joby Gorillapod about 6 inches high. The camera goes in a small case on my belt and the tripod in a pocket. So as I arrived one might ask where my camera was. And I was asking myself should I even take out my tiny camera. The tiny camera is by choice. As they say: “The best camera is the one you have with you”. And anything much bigger I won’t have with me. But my trusty little camera just sits there waiting for the right moment. Often it’s just a matter of being at the right place at the right time when the light decides to be pretty. This photos was taken near the end of the walk. Standing to my right is a number of huge tripods and fancy cameras. You can pretty much see how high my tripod was. I might have tried to pick a higher vantage point somehow but I had done a few photos recently where the texture of the stone on the ground had come out nicely and that’s what I was aiming for. I was fortunate to have the bike standing where it was There was a couple along for the walk that had a pair of them. (Very nice little Brompton bikes. I hope to own one some day.) It was the lady’s bike and she asked me if she should move it. No way! She told me that at the outset she thought her husband’s camera was the smallest but in fact it was mine that was. And the photo turned out nicely. The pyramids are often pretty just as it’s changing from day to night as it was here. I think the yellow light causes the white balance to push the blue and you get this super effect. So it’s Paris, the Louvre Pyramids, pretty light and a bonus bike. This entry was posted in Paris, Photography and tagged Cycling, Paris, Photography on April 30, 2015 by robezman. 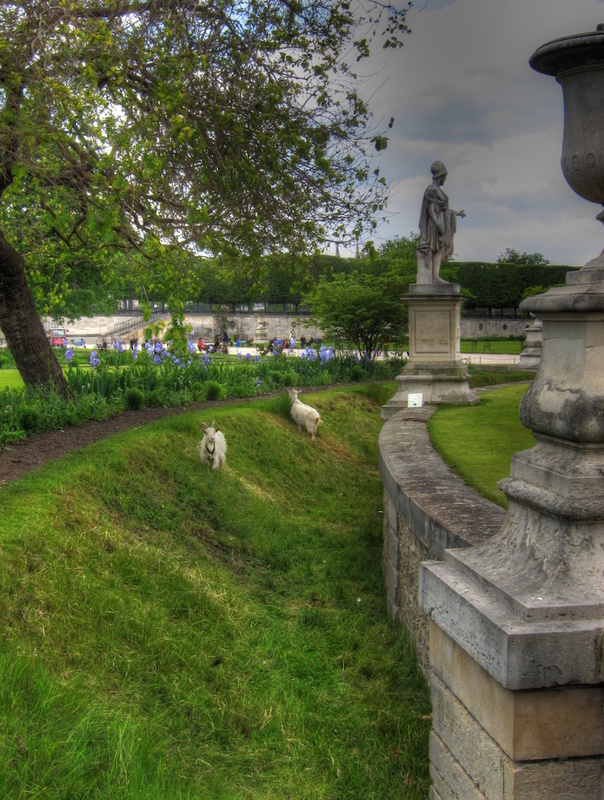 Some more HDR. 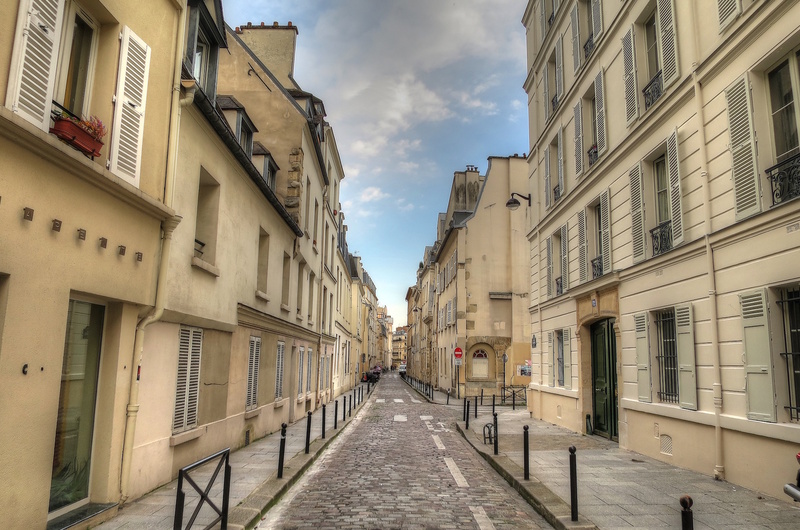 A street not far from where I live in Paris. This is the photo that got me into HDR. I read Trey Ratcliff’s HDR Tutorial and gave it a try. Funny enough I didn’t secure the tripod well. Right after the third click of the last photo being taken the camera tipped over. But all was right and it turned out and I was pulled to the dark side of HDR. 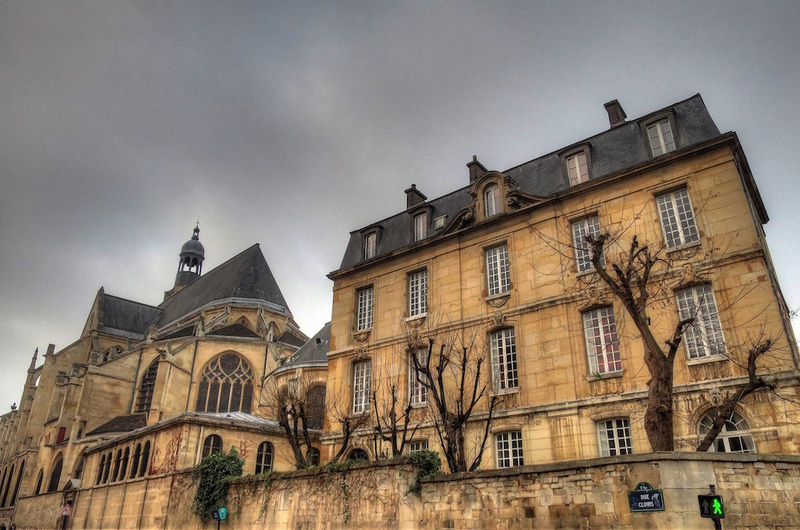 This entry was posted in Photography and tagged HDR, Paris on April 25, 2015 by robezman.